For those of us who have a front-row seat to the digital transformation of the customer experience in life insurance, there is a sense that our world is being, or about to be, rocked. Prior to the digital age, it was hard to do this in any setting other than in person or face to face with an agent. Now, if we are to recognize omnichannel expectations, we need to ensure we are covering all of these bases in whatever channel we are using. And if we are using multiple channels, we had better be saying and conveying the same thing, because gaps or inconsistencies create mistrust. For example, if your website offers a needs assessment or a wellness scoring system, your agent channel should be well versed in it too. Imagine someone engaging with your online tools, getting a result and then switching to your agent channel for advice about it. Then imagine the agent doesn’t know about the tool, doesn’t understand it or, worse, chooses to dismiss it. How would it make that potential customer feel about your company? We must find the people who are best suited for what we offer and engage them in a way that’s meaningful to them, leading to openness to learning about what we can deliver. Best suited means many things. With life insurance, in particular, it can mean health classification, financial status, need or even geography, as residents of certain states can’t get access to all products available. To figure this out, we need the most sophisticated tools at our disposal. In addition, we must communicate in an authentic way, especially in scenarios where there is no human being talking with them. If they are engaging in an online environment, the communication needs to “feel” human and real. Here is where we actually exchange a person’s time, data and money for a product. In life insurance, this is where the application lives and the way in which we take payment. There has been a great deal of industry focus and technology development around this phase to help life carriers improve the customer experience, work smarter (not harder) and attract new business by leveraging data and advanced analytics to use a more streamlined approach to assessing risk. This is fancy talk for how we make sure we are delighting our new customers in unexpected ways and keeping them. For the life insurance industry, this phase will be particularly challenging, as it has been focused mostly on the process of how bills are received, preventing lapses and, ultimately, how claims are handled. These, however, are table stakes. Raving fans don’t come from meeting expectations; they come from exceeding them. Here is where a raving fan gets to tell others about his/her experience and presumably get others involved. While life insurance is generally a low involvement product category, and one that is challenged by negativity associated with death, there are indirect ways to find positives within the experience. We have an opportunity to create positive experiences through services, information exchange and learning, and/or creating awareness of others’ experiences. The Ice Bucket Challenge for ALS is an example of where negative feelings of fear and helplessness were turned into people feeling empowered to help. The challenge went viral, creating much greater awareness and research funding for a disease that many knew little about. In what ways might the life insurance industry take a lesson from that? If you’d like to learn more, join us for a webinar on Thursday, May 24, 2018 in partnership with LexisNexis® Risk Solutions. 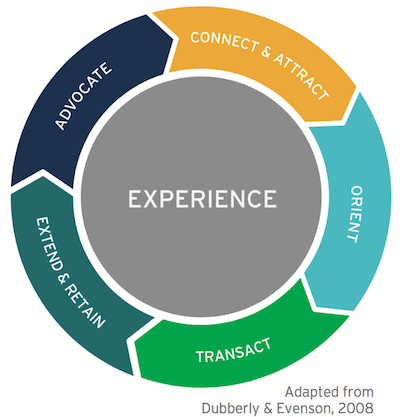 During this first webinar, our speakers will explore the first phase of the customer experience cycle — Connect & Attract — and share key insights and findings life carriers can use to transform the customer experience in life insurance starting at the point of marketing.